Type: EQUIPMENT. Detail: GARDEN. Product Code: GMC. Material: nylon fabric matSize: 9' x 9' full size with 13'' squaresThe nylon fabric giant mat is made of heavyduty nylon fabric with 13" stitched squares. This chess board can be folded and walked on and it still looks fine! It can also be machine washed. 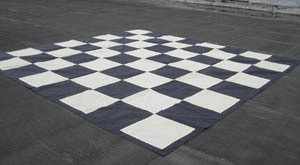 It accomodates the giant chess pieces perfectly and folds down to a tiny 15" x 15" x 1". It is included if you order a Giant Chess Set (GCC). Four metal tent pegs are provided to keep it fastened to the ground.